Recombinant fragment corresponding to Human NELFe. WB: HeLa, T47-D, HepG2 or 293T lysate, HepG2 cells. Mouse and Rat brain lysates. ICC/IF: HeLa cells. FC: HeLa cells. IP: HeLa cells. Our Abpromise guarantee covers the use of ab170104 in the following tested applications. WB 1/1000 - 1/5000. Predicted molecular weight: 44 kDa. Widely expressed. Expressed in heart, brain, lung, placenta, liver, skeletal muscle, kidney and pancreas. Belongs to the RRM NELF-E family. The RRM domain interacts with RNA, and is essential for NELF complex function. It is however not required for the NELF complex formation. Immunocytochemistry/ Immunofluorescence analysis of HeLa (Human cervix adenocarcinoma epithelial cell) cells labeling NELFe with Purified ab170104 at 1:500 dilution (0.5 µg/ml). Cells were fixed in 4% Paraformaldehyde and permeabilized with 0.1% tritonX-100. 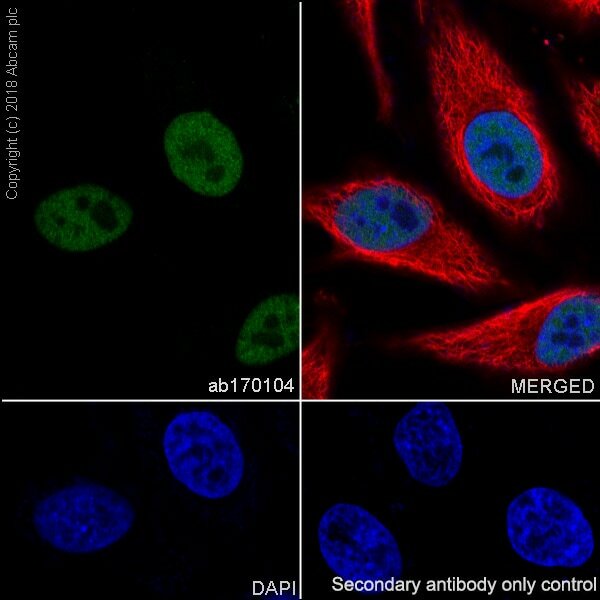 Cells were counterstained with Ab195889 Anti-alpha Tubulin antibody [DM1A] - Microtubule Marker (Alexa Fluor® 594) 1:200 (2.5 µg/ml). 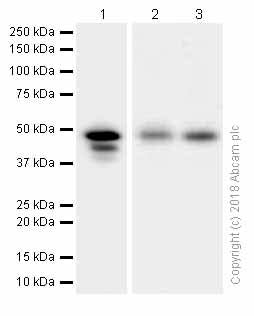 Goat anti rabbit IgG (Alexa Fluor® 488, ab150077) was used as the secondary antibody at 1:1000 (2 µg/ml) dilution. DAPI nuclear counterstain. PBS instead of the primary antibody was used as the secondary antibody only control. ab170104 (purified) at 1:20 dilution (2µg) immunoprecipitating NELFe in HeLa whole cell lysate. 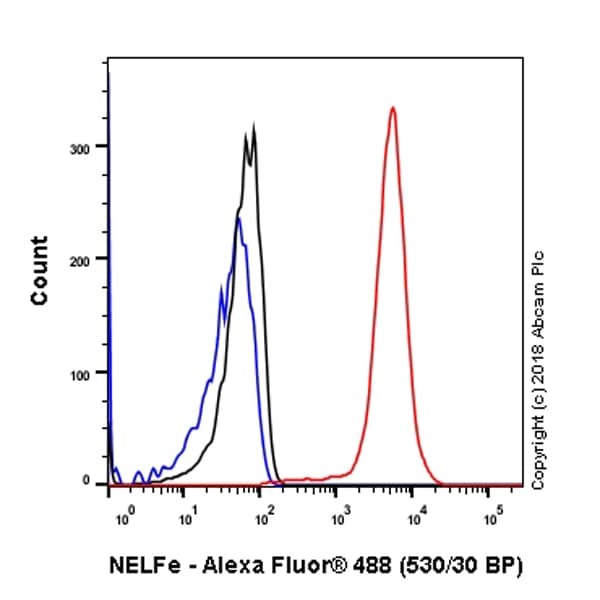 Flow Cytometry analysis of HeLa (Human cervix adenocarcinoma epithelial cell) cells labeling NELFe with Purified ab170104 at 1:300 dilution (1 µg/ml) (red). Cells were fixed with 4% Paraformaldehyde. 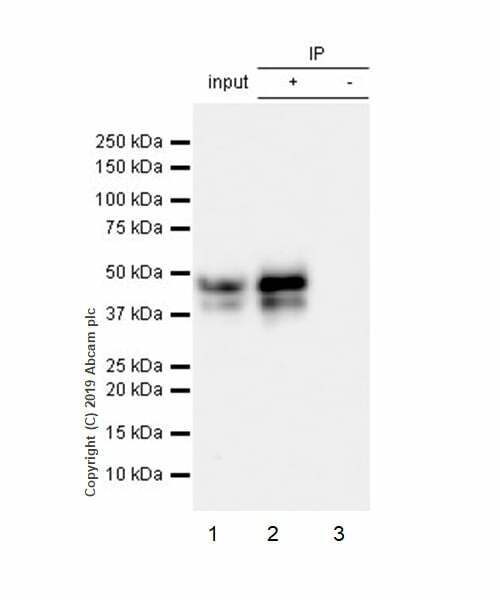 A Goat anti rabbit IgG (Alexa Fluor® 488, ab150077) secondary antibody was used at 1:2000. Isotype control - Rabbit monoclonal IgG (Black). Unlabeled control - Cell without incubation with primary antibody and secondary antibody (Blue). Immunofluorescence analysis of HepG2 cells labeling NELFe with ab170104 at a 1/100 dilution. Western blot analysis on immunoprecipitation pellet from HeLa cell lysate (lane 1) or 1X PBS (negative control) (lane 2) using ab170104, and HRP-conjugated anti-rabbit IgG preferentially detecting the non-reduced form of rabbit IgG. Publishing research using ab170104? Please let us know so that we can cite the reference in this datasheet. There are currently no Customer reviews or Questions for ab170104.